Last weekend was the first country music festival in New York City! 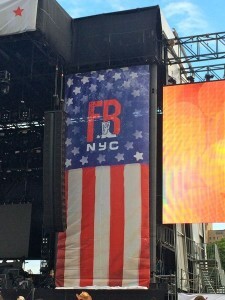 I’m a big fan of country music and there were many great musicians who made it to the big apple to partake in the festivities held on Randall’s Island – from up and coming artists such as the fantastic Striking Matches and Dallas Smith to big name artists such as Dierks Bentley, Brad Paisley and Luke Bryan. Three days of great music and some really good food. One of the things that I tried at the festival was corn in a cup. What a yummy treat. 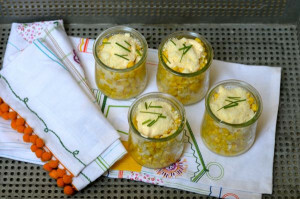 Corn in a cup is a traditional Mexican street food, which is made with Queso Fresco crumbled cheese. The version I tasted at the festival used parmesan cheese which was delicious and cheese I always have on hand in my home. I made these little cups in advance and heated in the microwave for 1 minute before serving. I’m planning on serving corn in the cup this holiday weekend! From by the bay wishing you creamy corn food memories! Using a knife remove all the kernels from the husk and place in a bowl. Bring a medium saucepan of salted water to a boil. Add the corn kernels and cook for 2 to 3 minutes. Strain corn. In a bowl add the butter and top with the strained hot corn. Mix until butter is melted, salt and pepper to taste. Take for glass cups fill each half way with corn, add 1 teaspoon of sour cream and 1 teaspoon grated parmesan cheese. Top with corn and add another teaspoon each of sour cream and parmesan cheese. Garnish with chopped chives. Serve immediately or don’t add chives cover with plastic wrap and place in refrigerator until ready to serve. Microwave for 1 minute , garnish with chives and serve. This entry was posted in side dish and tagged corn in a cup, Dallas Smith, elote, Farmborough, Luke Bryan, mexican cooking, mexican recipes, parmesan recipes, Striking Matches, summer foods, summer recipes, summer sides on July 1, 2015 by entertainingbythebay.